the perfect breading ground for bacteria to grow which cause unwanted skin issues when the bacteria is transferred to your face! So, long story short, it’s time. Don’t worry, we’ll walk you through it. Run your brush under lukewarm water, being careful to keep the water (and soap in the next step) away from where the bristles connect to the handle as the water can loosen the glue. Put a small amount of soap in your hand and work your soap solution into the brush with a gentle swirling motion. Once they’re good and soaped-up and all of the build up is breaking down/coming out, run under lukewarm water again, continuing to swirl on hand until you can see the water running clear from it. Gently squeeze out the excess water in a downward motion, moving with the direction of the bristles. Lay your clean brush on your towel and fold the top of the towel over the brush to soak up excess water. Leave the brushes overnight to dry. 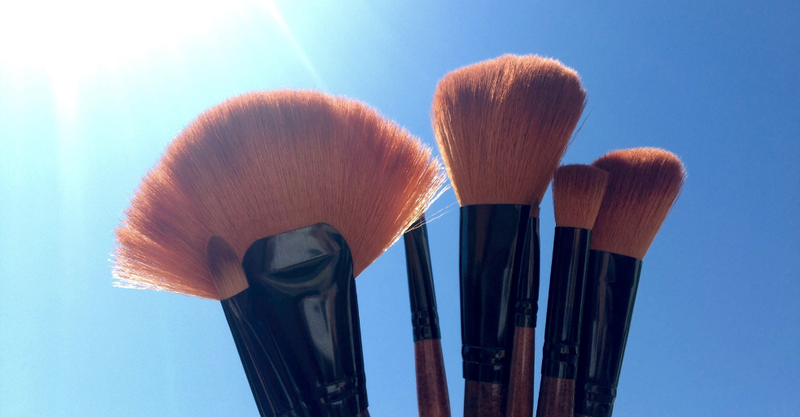 Don’t use brushes before they’ve had a chance to completely dry! If your brush feels extra stiff it could mean that you did not rinse all of the soap out of the brush; rinse again and let dry. Ideally you would clean them after every use, but once a week/every two weeks gets the job done. Prev:The secret of flawless skin is out!